The tour begins at 8:00 A.M. and heads straight for the ancient archaeological site of Chavin de Huantar. We will pass through the villages of Recuay, referred to as the doorway to the Callejon de Huaylas, a city that still retains its colonial style and was little affected by the earthquake of 1970. Then we reach the rural community of Catac (3500m) which is one of the largest producers of cheese in the department of Ancash. 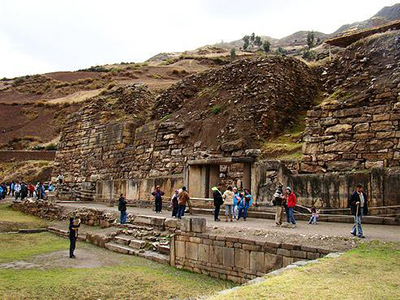 Here we take a detour that takes us to the ceremonial center of Chavin de Huantar. Here we will see large pastures where locals breed cattle, which feeds the cities throughout the year. Our next stop will be the Lake Querococha (4010m), where we will make a brief stop to take pictures. Then we will continue uphill until we reach the tunnel Cahuish (4500m) with almost half a kilometer in length. From there we will enter the Conchucos valley. The course of the road is downhill until we reach the ceremonial center. We will enjoy a traditional lunch made for those touring this ceremonial center. This historic ceremonial center dates back to 1,000 years ago and is considered one of the major cultural influences of Peru. Here many researchers excelled in architecture, astronomy, and other sciences. We begin with an outline of our tour's route and then will see the replica of the Raimondi Stela, which is located at the entrance. From there we will continue to the replica of the obelisk Tello. Continuing from there we reach the square that was built in a sunken platform. Then we will go to the temple of Chavin, a circular plaza, where we will see a statue the chief god of this culture, Lanzon. It is found inside a gallery which bears the same name. We will also see the statue heads regarded as the Chavin temple guards. Afterwards, our bus will take us back towards the city of Huaraz, a two hour trip.